Rina and Zcharia restaurant is one of the best local food experience you can have. 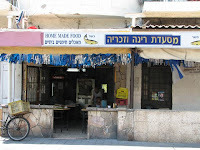 Their menu contain original Yemenite food, of which the soups are mostly recommended. Their special soups are made of meat which was stewed in a big pot for hours, giving the meat and broth an amazing taste and texture. Besides the soups, they also have skewers and vegetables dishes (pick the whole grain rice with okra). All dishes are served with a Yeminite pita and Lachuch (a spongy pancake like bread, see the pic below) which fit the soups perfectly, some Zhug (spicy sauce) and Hilbe (semi-spicy jam-like spread made of the Fenugreek plant, in the pic too). Rina and Zcharia are an old couple who run this place for many years and they will be happy to help you to choose what you like. 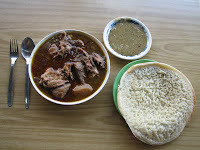 They will usually recommend on the normal dishes - beef or chicken - and not on the more local dishes (e.g. kidney or lungs soup), as they are afraid you will not like it. If you are really adventurous, try to surprise them by asking for the Bis soup (cow's udders soup, sounds like the word "bees" in English). Hakovshim st. starts on Allenby street near the beach. You can go down on Allenby towards the beach until you hit Hakovshim st., then you take left and then go straight all the way. Or, you can take left from Allenby to Ge'ula street, that connects to Hakovshim in the middle (then take left to Hakovshim).